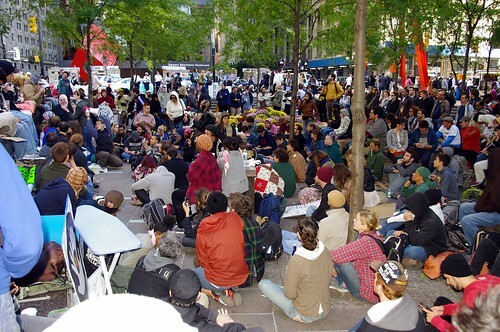 Over the past ten days, hundreds of people have occupied Zuccotti Park in lower Manhattan in New York as part of Occupy Wall Street. Citizens have faced down a city that has fortified Wall Street with blockades so corporate criminals responsible for the economic collapse in 2008 can avoid confrontations with angry, passionate Americans. Citizens have camped out and held daily marches in the face of a massive police presence, which has sometimes been very intimidating as individuals have been arbitrarily picked off and arrested. And last weekend, the police corralled them into an area near Union Square and proceeded to make a number of violent arrests; eighty to one hundred were arrested on Saturday. Traditional media have characterized the plurality of voices and the number of issues the occupation is seeking to challenge as a weakness. Establishment media has been openly condescending. Ginia Bellafante’s report in the New York Times has generated significant attention for her focus on the fact that some “half-naked woman” who looks like Joni Mitchell to her is the leader of this movement of “rightly frustrated young people.” [cont’d.] Bellafante accuses the protesters of lacking “cohesion” and “pantomiming progressivism rather than practice it knowledgeably.” NPR reiterated NYT’s focus on the “scattered nature of the movement” in its coverage of the occupation (and tellingly used a photo of a man holding a sign that reads “Satan Controls Wall St”). Local press have treated the occupiers as if they are a tribe or a group of nomads focusing on occupiers’ behavior instead of trying to understand the real reason why people are in the park. First off, nobody in the last week can claim to be reporting on Occupy Wall Street and genuinely claim it isn’t gaining traction. Ellis conveniently leaves out the fact that Occupy Wall Street is inspiring other cities to get organized and hold similar assemblies/occupations. Second, if the protesters did have one demand, does Ellis really think that would improve media coverage? Wouldn’t pundits then be casting doubt on whether the one demand was the appropriate singular demand to be making? Third, so-called members of Anonymous are citizens like Ellis and have a right to participate in the protest. It is elitist for Ellis to suggest Occupy Wall Street should not be all-inclusive. And, finally, there is no evidence that just “dreamers” are getting involved. A union at the City University of New York, the Industrial Workers of the World, construction workers, 9/11 responders and now a postal workers and teachers union have shown interest in the occupation. Maher: You have to wonder what will make people rise up? Harman: The people in the political middle rise up and demand that people in Congress get some work done. Where are they? Moore: How would you have them rise up? Write a letter to the editor? Harman: No, I think there are a lot of good people in Congress but it is a broken place. Maher: If you mean like centrist Democrats, I think they’re the problem. Like the Democrats have 53 senators… Like forty of them are good but it’s people like Mary Landrieu—Jim Webb came out against Obama’s taxing the millionaires plan. It’s those centrist Democrats who are really corporatist Democrats, who work with the Republicans—That’s what cockblocks everything in this country. Maher: Who works together? It’s those Max Baucus Democrats with the Republicans. That’s who works together. At the same time, I’m not waiting for him. I’m with the people in Madison. I’m with the people occupying Wall Street. That’s what my music is about. And I know Michael knows this too – when progressive, radical or even revolutionary changes happen, it’s always come from below. When women got the right to vote, when lunch counters were desegregated, it was people you do not read about in history books who stood up in their time for what they believed in.